All parts of the walnut tree contain tons of biologically active substances: bark – triterpenoids, steroids, alkaloids, vitamin C, tannins, quinones, etc. 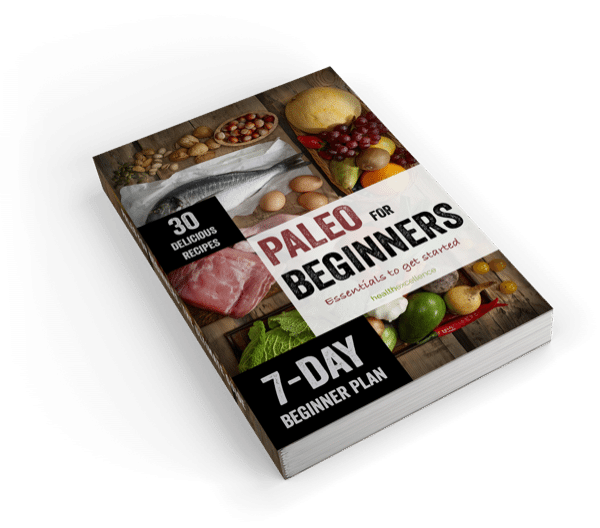 ; leaves – aldehydes, essential oils, alkaloids, vitamins C, carotene, phenol carbonic acids, tannins, coumarins, flavonoids, anthocyanins, quinones and higher aromatic hydrocarbons; pericarp – organic acids, vitamin C, carotene, phenol carbonic acids, tannins, coumarins and quinones. In other words, this is a truly unique tree. Despite the huge amount of fats, walnuts can help to lower blood cholesterol level, at least, in men. By the way, cholesterol level in females is not so critical, so everything is fine. Several years ago, one experiment involving a group of volunteers was conducted in the United States. They received 20% of the calories of the daily diet from walnuts. It was found that the cholesterol content of the subjects decreased on average by 12%, and the so-called bad cholesterol – by even more. A ripe walnut is not only a food but also a highly active drug. Walnuts are recommended for the prevention and treatment of atherosclerosis, deficiency of vitamins, salts of cobalt and iron in the body. Walnuts contain a lot of fat and oil, which are able to improve the activity of the intestines. They are especially useful for older people who are prone to constipation. If you look back a few centuries ago, you may notice that people were widely using walnut decoctions. Such decoction of the leaves is used as a lotion that promotes wound healing, for a treatment of scrofula and rickets in children while the kernel – as a multivitamin substance. 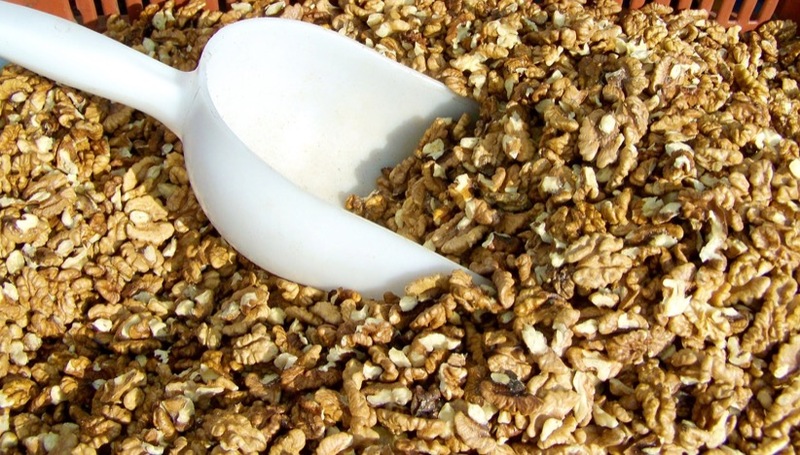 Drugs made of walnuts exert bactericidal, tonic, anti-sclerotic, astringent, antidiarrheal, laxative (root bark), moderate hypoglycemic, hemostatic, anti-inflammatory, anthelmintic, healing and effects. Walnuts improve the blood circulation in the genital area and stimulate spermatogenesis. Walnut is an excellent means for weight loss and body rejuvenating. 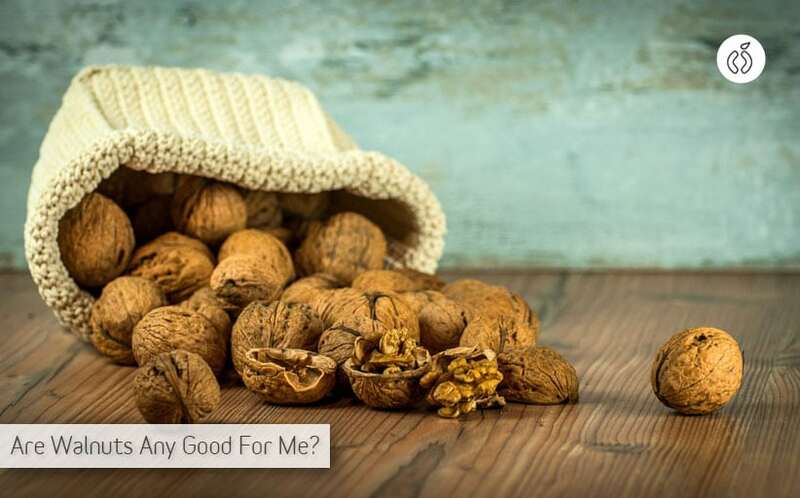 Unsaturated fatty acids found in walnuts are not synthesized in the body and cannot be replaced with the fatty acids contained in animal fats. Walnuts contain phospholipids that reduce blood cholesterol and sitosterol that prevents cholesterol absorption in the digestive tract. Walnuts improve cellular immunity, reduce the concentration of circulating immune complexes by increasing body resistance to acute respiratory diseases. Vitamin C and minerals Zn and Cu exert a significant antioxidant effect. By reinforcing the vessel wall, they prevent fat infiltration of the liver and the vessel walls, which is important in the treatment and prevention of cardiovascular disease, liver and endocrine system diseases, including diabetes. What is more, walnuts lower the cholesterol production, strengthen the vascular wall, reduce the process of free-radical oxidation. Walnuts are also used for prevention of cardiovascular diseases. Walnuts exert a strong healing effect. B2, contained in walnuts, stimulates the so-called carbohydrate oxidation processes. It positively influences the nervous system, heart, blood vessels. Moreover, walnuts contain a lot of carbohydrates. They exert an anti-microbial effect. This effect helps in the treatment of catarrhal diseases: bronchitis, tonsillitis. Walnut is the most useful kind of nuts, and U.S. scientists recommend to include walnuts in the daily diet. Researchers from Pennsylvania told the American Chemical Society that walnuts have the highest content of antioxidants compared to other types of nuts. Antioxidants help to protect the human body from the disease since they prevent a chain reaction that destroys the cells during the oxidation process. Scientists believe that all nuts are very nutritious, but walnuts are much more useful than peanuts, almonds or pistachios. Joe Vinson, who works at the University of Scranton, has analyzed umber of antioxidants in nine types of nuts and discovered that walnuts contain twice the amount of antioxidants in all other types of nuts. It was also found that the quality of the antioxidants and their biological activity were higher than in other nuts. As it is stated in the study, antioxidants, which are contained in walnuts, exert the effect that is from 2 to 15 times more potent than vitamin E. Meanwhile, it is known that this vitamin protects human cells from damage by natural chemicals that cause various diseases. Walnuts also contain high-quality protein, a variety of vitamins, minerals and fiber, and there is no gluten that is dangerous and often causes allergies. Previous studies have shown that regular consumption of small amounts of walnuts reduces the risk of heart disease, cancers, both types of diabetes, but also prevents many other problems related to health. Joe Vinson claims that there is one more benefit of walnuts as antioxidants. According to Vinson, high temperatures reduce the quality of the antioxidants, while walnuts are usually eaten in the raw form, so people can fully benefit from the effectiveness of antioxidants contained in them. None of the useful properties of walnuts has been so thoroughly studied and proven as their positive effect on the cardiovascular system. Walnuts affect ‘vascular reactivity’ – the ability of our blood vessels to adapt quickly to changes in the environment. Studies confirm beneficial effects of walnuts on the blood pressure. Intake of omega-3, including the form of alpha-linolenic acid contained in walnuts, helps improve cardiovascular function including blood pressure. Just 4 walnuts per day significantly increase its level in the blood. How many walnuts should be eaten per day? Walnuts, with their useful properties that are absolutely essential for a growing body, must be present in the diet of children, lactating mothers, and pregnant women. It is best to consult in advance with your doctor the question of how many walnuts need to be eaten per day. Usually, pregnant females eat them at the dosage from ten to twelve walnuts, while children – five to seven. An adult person who has no contraindications can eat up to ten walnuts per day. There is no point in eating more than that. Metabolic syndrome is not a disease but a result of the accumulated body problems, including the excess fat in the blood (triglycerides), high blood pressure, elevated cholesterol level, and obesity. Recent studies have shown that approximately 30 grams of nuts per day for 2-3 months can help reduce the risk of these problems. Prevention of type II diabetes is associated primarily with control of sugar and insulin levels in the metabolism. 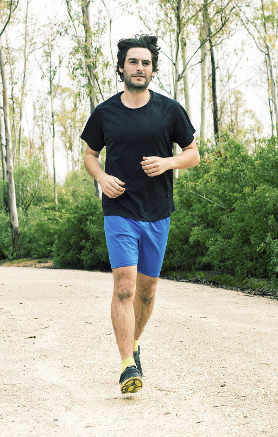 People diagnosed with type 2 diabetes tend to have health problems in other connected systems of the body and are at a particular risk of developing cardiovascular diseases. While planning a diet for people with diabetes, the main objective is to reduce the risk of future cardiovascular problems. 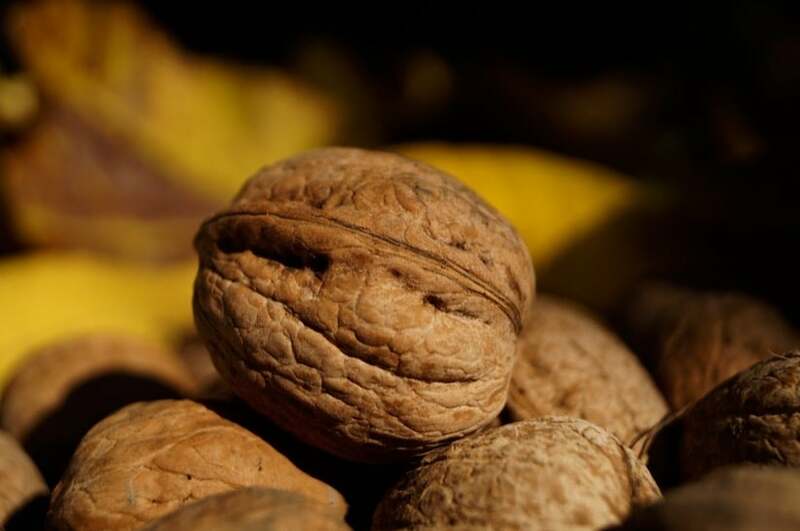 Walnut intake favors the increase of flexibility and stability of the cardiovascular system. 30-60 grams of walnuts per day will give a good effect in the treatment of diabetes (type 2). The antioxidant properties of walnuts can help reduce the risk of chronic oxidative stress, and increase the anti-inflammatory properties that help reduce the risks of chronic inflammation, which, taken together, represent the greatest cancer prevention means. 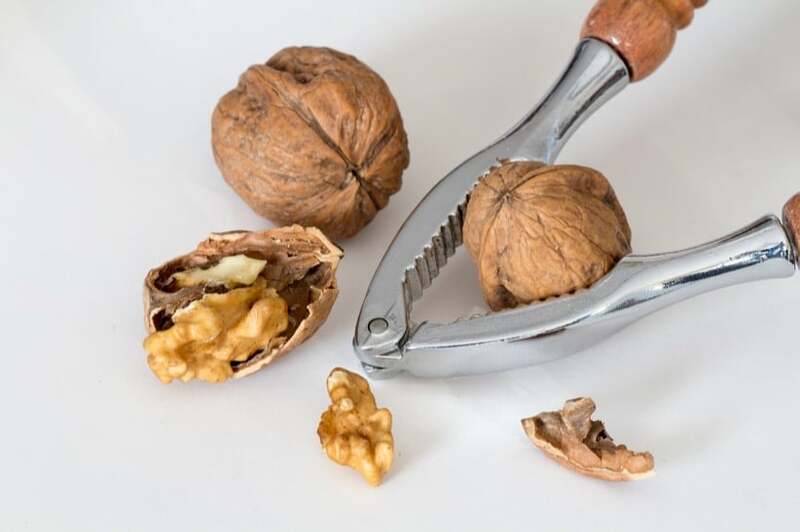 Prostate cancer and breast cancer are the most studied types of cancer for which walnut consumption significantly decreased the risk of their occurrence. In this particular case, the best dose is 30-60 grams of walnuts a day. Walnuts are included into the list of foods that are recommended for male potency enhancement. Regular consumption of walnuts allows to accumulate the necessary energy and an abundance of antioxidants, minerals and vitamins increase the tone of the whole organism. In order to maintain male potency, it is recommended to consume 30-50 grams of walnuts per day. Anti-inflammatory substances in walnuts play a significant role in supporting bone health, promote weight loss and prevention of obesity. Another useful aspect of walnuts – the content of melatonin (MLT). MLT plays an important role in the regulation of sleep, daily (circadian) rhythms, reorganizations in connection with the light and dark time of day, as well as other processes. Walnut is a superfood, the benefits of which are simply impossible to overstate. Eat up to 10 walnuts daily and you’ll be fine!